I write books and journalism about visual and popular culture, in particular art, design, fashion, music and media. I also curate exhibitions. Can you tell us a bit about your experiences with David Bowie? What did you think of him? I met David Bowie when I was a member of a small think-tank for the charity War Child, working on the 1994 London art show Little Pieces From Big Stars which exhibited and then auctioned artworks produced by musicians. The exhibition and auction dinner were organised by Brian Eno and his wife Anthea. Bowie was very engaging, evidently super-bright and witty. My first wife Jen Ross helped organise the printing not only for the War Child events but also for an art show about Minotaurs to which Bowie contributed and designed a poster. It made her day when he rang her out of the blue to thank her and asked intensively about the printing process. Later he signed one of the posters to she and I and our dog Tom. I subsequently interviewed Bowie twice (for the release of his 1995 album Outside and the 1997 follow-up Earthling) and both times he was humorous, informative and charming, apparently without artifice. He was subsequently helpful to me, contributing to my book with Goldie, called Nine Lives, and was going to contribute to my 2015 monograph of the artist Derek Boshier – they worked together, most notably on the design for the 1979 LP Lodger – but ill-health intervened. He did however write to Derek six weeks before he died saying how much he loved the book and praising Derek as “a master”. How were you involved in the War Child event in 1995? Having staged an art exhibition Brian Eno decided to put on a fashion show for War Child, with designs by musicians: a quirky leather tie by Lou Reed, Jarvis Cocker designed (and modelled) some strange shoes and Bowie produced a suit of bandages. Brian Eno put together a soundtrack of new music and I suggested a couple of tracks: Jon Spencer Blues Explosion’s Bell Bottoms and Cornershop’s 6am Juillander Shere. Called Pagan FunWear, a bacchanalian feast was held at the Saatchi Gallery in St John’s Wood on midsummer’s night 1995 and then the fashion show took place and the designs were auctioned before an audience including Naomi Campbell, Bryan Ferry, Bjork, Tricky, Vic Reeves and Liam Gallagher. 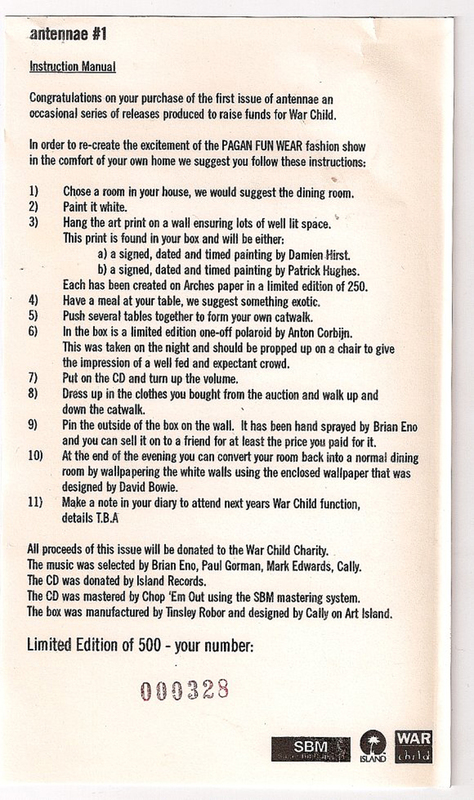 As a way of marking the event and to raise further funds, Brian Eno conceived of a limited edition box called Antennae #1 containing a CD of the music, a photo by Anton Corbjin, a small watercolour by Patrick Hughes and a scrap of the wallpaper Bowie had recently exhibited at his art show New Afro Pagan Work: 1975 – 1995 at The Gallery, 28 Cork Street, London, in April that year. 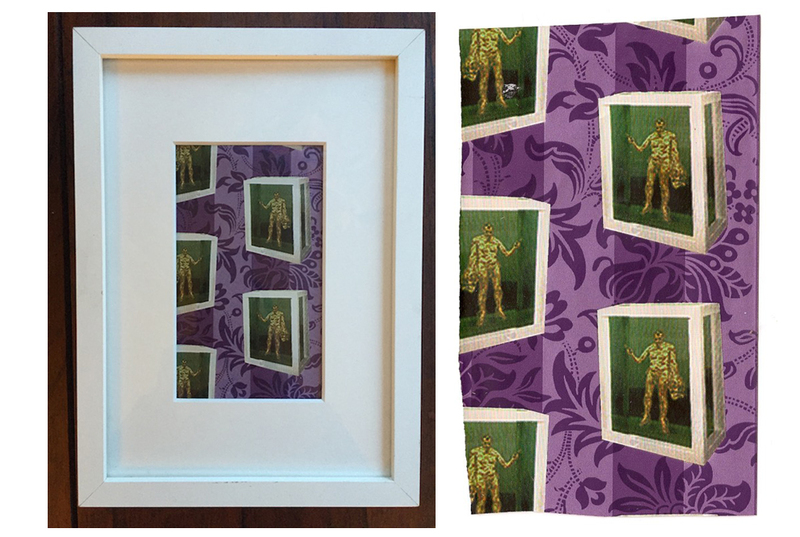 We bought a box – they were £100 each – and the framed wallpaper shred, showing a repeat print of a computerised image of Lucian Freud, was among the items I loaned to the 2011 exhibition Ideal Home, held at London gallery Chelsea Space. Is there anything that stands out for you about this event? The event was something of a marker in the coalescing of both Britpop and BritArt, in that leading lights of both scenes – including Jarvis Cocker and Damien Hirst – were involved and soon they had entered the public imagination. Was there anything significant you think about the fact that David chose to use the Laura Ashley design within the background? A couple of days before Bowie died I had cause to visit the lock-up where my archive of clothing, music, books, magazines and ephemera is stored. Usually I like to bring back something small and random with me, and this time, without much thought, I returned to my office with the framed wallpaper shred and hung it on the wall behind my desk. When I heard the news of Bowie’s death on the Monday morning I wrote a piece for my blog; the wallpaper offered itself as an intro point. 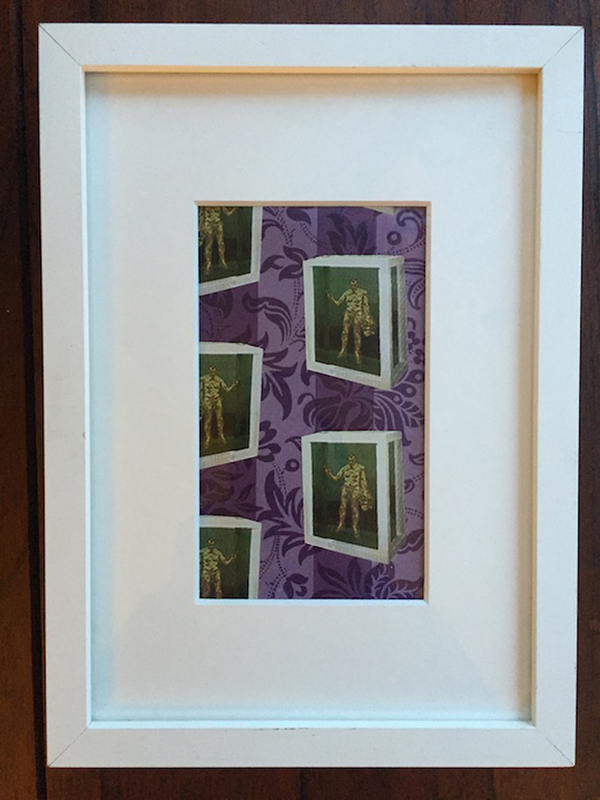 I signed off the piece in this way: “The fact that this shred depicting the great and serious artist Freud uses as its base a quintessentially English Laura Ashley print makes it funny, and, somehow, for me, very, very Bowie.” The post prompted contributions in the comment section which helped complete the story of how the wallpaper came about. 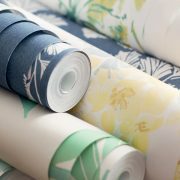 Minimal amounts of rolls – 10/15 at most – were produced in two designs at the Laura Ashley wallpaper printing facility in Wales: one of which was the Lucian Freud. There had been a proposal to produce a design featuring a naked Minotaur, but this was rejected. 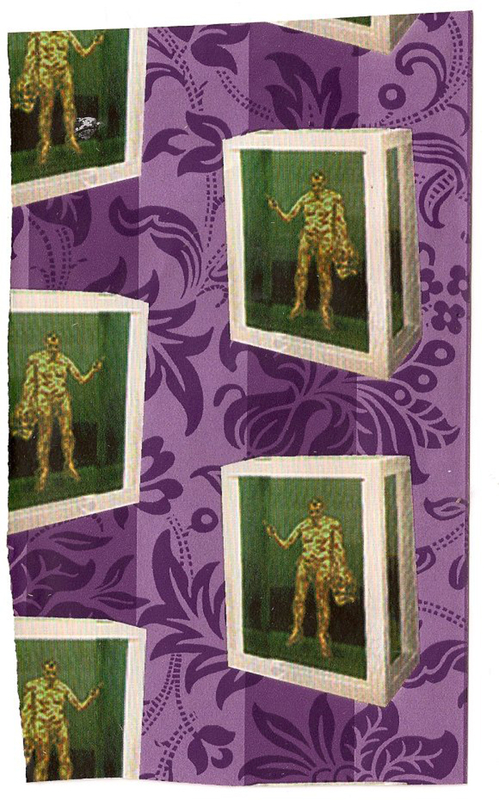 “I had the dubious pleasure of informing Mr Bowie (his people, not the man himself of course) that it would be inappropriate for Laura Ashley to produce a wallpaper featuring the anatomy of a Minotaur and would he mind terribly adapting the design to something more… er… palatable,” says Moore, who lives in Australia these days. Another of my readers, Yannic Franz from Germany, wrote that he was given two rolls by a British friend who said they had heard the designs were something to do with David Bowie. “Since I couldn’t find anything about them on the Net or anywhere else I just took it for a practical joke and almost forgot about them until I saw your post,” Franz wrote to me. Franz also turned me on to a 1996 Dutch TV interview where Bowie is questioned about the wallpaper and a member of the audience brings him a shred of the Freud design to autograph. 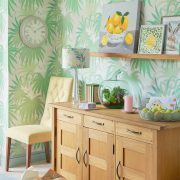 Check out this link to see how Laura Ashley wallpaper is printed. I believe some of Bowie’s wallpapers are held in the Whitworth Gallery in Manchester, where they can probably be viewed by appointment. Will you be reissuing this wallpaper now that Bowie has passed? If so, I would be interested in buying it. Unfortunately, we will not be reissuing this wallpaper. Apologies! I have 4 rolls of approx 10 mtr each. 2 rolls of the green and 2 rolls of the purple design. Printed at the laura ashley factory in Newtown powys. Its been kept in our family for years but we are wondering what to do with it? I have pictures to prove it. I have some of this wall paper. I worked at an exhibition company in the 90’s. Awe built exhibition stands for Rover cars, one of which had a number of Minis, the old ones not the BMW version. There was a Bowie Mini which was all chrome to show his chameleon nature. The back drop was covered with his wallpaper, I was/am a massive Bowie fan and when the painters were throwing the offcuts away I asked if I could have them. Luckily they’ve been in a suitcase since then. Now I’m thinking of selling most of it. I was wondering whether to contact Sotheby’s to get a valuation.